﻿ Cultural Carriacou, music and origins, wedding and funeral. Cultural Carriacou, music and origins, wedding and funeral. Music at funerals and weddings, the Big Drum, Saracca and the Maroon festival. Culture of Carriacou is for large part from African origins and traditions. Culture on Carriacou – music and origins, weddings and funerals. Tombstone – Big Drum – Saraca – Carnaval Parang and Jóuvert. Carriacou is a small community, largely sustained by the proceeds of migrant labour. The collective wisdom of experience, embodied in the relationship of the living to the Old Parents, has been an important element in developing and sustaining ways to survive against the odds. Kayaks, sometimes written as Kajaks, have retained a knowledge of individual regional and ethnic African identities. This is represented and embodied in the different dances and rhythms. Big Drum music, alongside the Creole and ‘frivolous’ rhythms, has African elements, but was created in the Caribbean. Music at funerals and weddings, the Big Drum, Saracca and the Maroon festival. Culture of Carriacou is strongly related to African origins and traditions. Several times a year the people of Carriacou display their African past as part of this traditional performance called the Big Drum Dance. 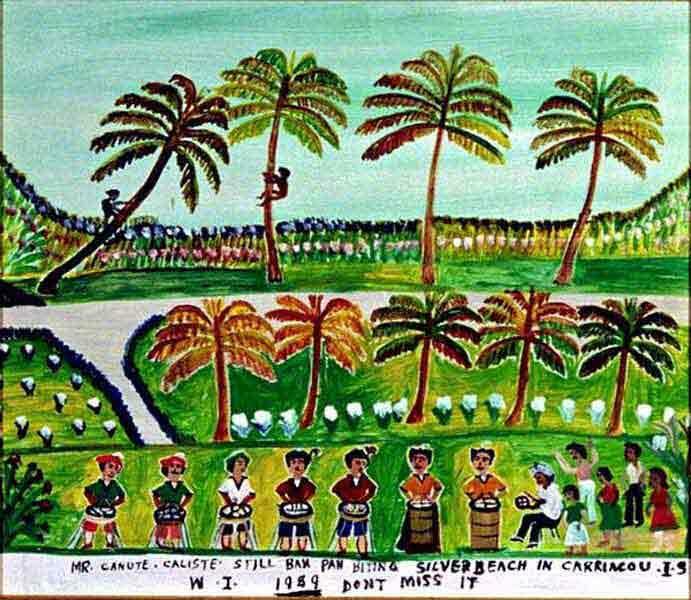 Read the article Temnes of Carriacou, an excellent article about the heritage of Carriacou ancestors. The Tombstone Feast is the final part of the rites associated with death and burial. Tombstone takes place when the grave of the departed is marked by the placing of a stone. As described in the review of Rounder 1726. Until the placement of a Tombstone can be done (which is dependent on funds being available, and the ability of those involved to travel home for the occasion), the memory of the dead person must be honoured each year. The memorial is held by a mass, prayer meeting or Big Drum. Once the stone is set, the spirit will rest comfortably. The Tombstone Feast is an important ritual. It maintains respect for the ancestors and the Old Parents, it unites and reunites the generations. It brings Carriacouans who have emigrated back home to friends and relatives left behind. The Big Drum music of Carriacou carries a huge freight of tradition, history and social meaning. Even such a simple aspect as being unable to see the dances that the music is played for constitutes a major barrier to one’s understanding of the processes and systems involved. The drinking of jack rum, the ritual sharing of food, the ‘wetting’ (libation) of the dance area with whiskey, rice and water. The story telling, the opportunities for youngsters to flirt discreetly – all these are present in the Tombstone Feast, but absent from our experience of it. One of those tidal pools, Carriacou is a tiny bead on the string of islands called the Grenadines. Quoting from Donald R. Hill. Carriacouan funeral music and ritual are part of a complex belief system centering on reverence for the ‘Old Parents,’ the 18th century African founders of Carriacouan society and on obtaining guidance for the living from the more recent Dead. A Saraca is a kind of funerary rite endemic to the Grenadines and Carriacou involving food for the celebrants as well as the deceased, music, special ritual and Nancy or Ananzi stories. This collection of songs includes lyrics derived from African ethnic traditions like the Cromanti, Manding, Igbo and others as well as English and French Creole. 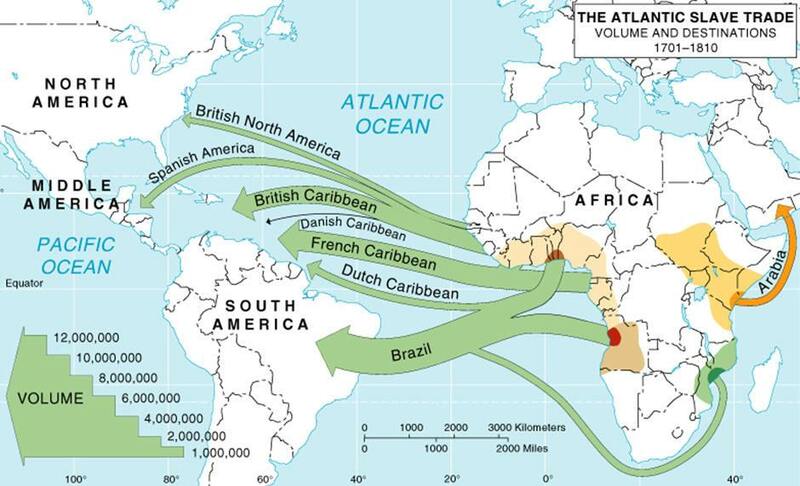 Slave trade between Africa and Americas. There are Big Drum songs, arguably the most important way the living entertained the dead. 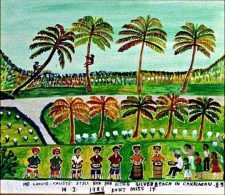 There is a Nancy story, a traditional instructive or cautionary tale, about the young woman who is the purported ancestress of all the people on Petit Martinique, another of the Grenadine chain of islands. African call and response shows up in lots of the renditions of spirituals like “Gone to Nineveh,” where the anthem is performed with trumping set as rhythmic motifs behind the call and response phrases. Sugar Adams and May Turner. The singers are some of the first proponents of Big Drum music to perform in the United States, thanks to Lomax and the American Museum of Natural History in 1975. Some of the performers, such as Sugar Adams and May Turner, were quite old at the time of this performance and were actively teaching the younger generations in the Big Drum tradition. The then younger singers, Lucien Duncan and Canute Caliste. Caliste was a painter as well and his painting of a Saraca is on the cover of the CD. Anyone who is seriously interested in investigating the African source of most popular music today owes a great debt of gratitude to Lomax and his collaborators for recording and archiving this exciting collection of Caribbean musics. The link with Africa comes through traditions like these and we’re fortunate to have this kind of documentation. The music is exciting, the stories interesting, the singing heartfelt. This is not music for entertainment particularly and it’s certainly not background music. It’s music for understanding and would be a valuable addition to any collection that aims for a consistent historical context. Carriacou is the largest of the Grenadine islands and is a dependency of Grenada. It is located approximately 25 nautical miles North of Grenada. Its surface is 13 square miles in area and has a population of approximately 8,000 people. Most of the population are of African ancestry. A small percentage of the population (between 5 and 10%) is of German, Scottish and French ancestry. Although Carriacou is small in size, it is rich in African Customs and Traditions when compared to some of our larger neighbouring Caribbean Islands. As part of this presentation, I was asked to mention any rituals that we may perform that are associated with Rights of Passage or Coming-of-Age. To put it in simpler terms, this is the transition from adolescence to adulthood. In Carriacou, we do not have a formal Coming-of-Age ritual for young people as performed by some of the African cultures. There is a phrase that is commonly used, “it takes a village to raise a child”. Well, I can say this was very evident in Carriacou when I was a youngster growing up on the Island. As a matter of fact, I can say that we were raised by the whole Island. From the moment a child left his or her parents house to go out, there were always a set of adult eyes monitoring his/her behaviour along the way until he/she returns home. I should note that in Carriacou, everyone is related through either marriage or bloodline, so no matter where you went there were always a relative or family friend that will be monitoring your behaviour. These adults also had the privilege to discipline a child on the spot and he/she dare not go home and complain because he/she would be disciplined again by a parent. Adults were always referred to as Cousin (e.g. Cousin Frank) and regardless of how many times you may cross paths for the day, you as a child was expected to acknowledge his or her presence by saying Good Morning or Good Evening, and so on. As a result of these strong disciplinary customs there were very few problems with the youths of the Island. Unfortunately, it is not quite the same today. Now, I may not be able to give you a plausible explanation for the meaning of some of the Customs that I will be talking about but none-the-less, we observed our parents perform a number of different rituals and we just continued with the Tradition. Three major rituals on Carriacou. My talk today will cover three major topics namely the Traditional Carriacouan Wedding, rituals associated with Death, and a village festival known as a Maroon. However, before I get into these topics, I would like to talk briefly about two rituals that are commonly performed in all of the topics that I will be speaking about today. These are “Wetting of the Ground” and “Big Drum”. The Wetting Of The Ground. In Carriacou we revere our dead and they are always remembered in just about every thing we do. We communicate with them spiritually in our daily lives. The “Wetting of the Ground” is a significant part of Carriacouan culture. It is used in remembrance of our dead in just about every occasion for celebration or undertaking a difficult task. For example, whenever, we open a new bottle of alcohol the first drink is poured onto the ground with some water and/or pop. Such as an offering to our dead relatives and friends. For example, the ritual of ground wetting must take place to give thanks to God and invite our dead relatives to celebrate with us spiritually. The “Ground Wetting” is conducted on a larger scale at ceremonies such as Weddings, Stone Feasts, Parents Plates and Thanksgiving celebrations. 9th and 40th Night Celebrations. Stone Feast or Bomennaire (erection of a head stone). Cambulet Nights where a stick dance is usually performed to the Big Drum. The spectators usually form a circle around the drummers, singers and dancers. The dance begins with what is called the “Opening of the Ring” at which the host family performs the ritual of “Wetting of the Ground” to the Big Drum beat. The musicians are usually 3 or more drummers (head or cut drum, and 2 bulla drums) and 6 or more singers most of whom are women. Most of the songs are sung in an African dialect but a few are sung in English, as well as French Patois. The drumbeats, rhythms are dances are representative of various African Nations. This is a slow dance with a lot of flare or gambash, as we say locally, that is performed only by strong males. This is the most popular of the dances and is performed by both men and women. Its origin is from the Ebo Tribe. The dance is usually for the less skilful and one is usually replaced in the ring by another dancer that feels that he/she has something better to offer. This is a very skillful dance that is performed mainly by women. This is also from the Ebo Tribe. This is a very joyful and happy dance that originated from the Swahali Tribe. This is a very skilful and dangerous dance that is performed only by men and its origin is from the Zulu Tribe. This dance is typically performed on Cambulay Night, which is the Sunday night of Carriacou Carnival. This event is usually held at a location known as “Thief”. Ashanti and Cramanti are also tribal dances that are performed at Big Drum dances. The songs that sung at a Big Drum are usually selected to suit the occasion. For example there are songs for Weddings, Prayer Nights, Maroons, Parents Plate and Thanksgivings. While I am on this topic I would like to acknowledge some of our legendary drummers Sugar Adams, Pofellar Corion, Hence Gay, Daniel Akins and Prince Lawrence and dancers May Adams, Seeday McGilvary Sae Gold and Lucian Duncan to name a few. These people have made substantial contributions in keeping the culture alive in Carriacou. The traditional Carriacou wedding is a beautiful experience that includes several fetes before and after the wedding ceremony. A young man in love would write a letter to the parents of his potential Bride stating that he is in love with their daughter and requests their permission for her hand in marriage. Once permission is granted, the couple would get engaged and courtship begins. Courting would last between 4 to 6 months while preparations are being made for the wedding day. Approximately 2 months before the wedding. A Flag will be flown on the roof of both the Bride and Groom’s parents house. The Flags would have messages such One Love, Peace and Love, etc. The flying of the flags usually coincide with the announcement of the first Wedding Banns. Between 2 and 3 weeks before the wedding. Both families would host a Parents Plate. At a Parents Plate, the close relatives of the family and the family of the Bride or Groom will be invited to partake in a meal prepared by the host family. Animals such as pigs, sheep and chickens will be slaughtered in the yard for this occasion. The ritual of Ground Wetting and prayers are usually conducted before the slaughtering of the animals, which are offered as a sacrifice for God’s blessings to be bestowed on the couple. The Ground Wetting on occasions such like this includes a prayer procession around the house and the wetting is done at all corners of the house. 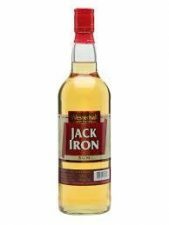 The drinks used for Ground Wetting ritual include Strong Rum (known locally as Jack Iron), Brandy, Whisky, plain water, sweet water, a variety of pop and juices. Small portions of the drinks are held back during the Ground Wetting ceremony and everyone in the procession takes a sip at the end the wetting to conclude the ritual. Choice cuts of meat are cooked separately without any salt or garlic and a special Table with a variety of foods, fruits, cakes and drinks is set for the dead relatives of the family. Food at a Carriacou wedding. The placing of the food on the Table takes place with a procession with each family member and/or relative carrying something for the Table. Once the Table is set, candles are lit and prayers are said for the dead. All of this activity must take place before 6:00 p.m. in the evening. The food from the Table is removed before 6:00 a.m. The following morning and children from the village are invited to partake in the eating of the food. The food for the wedding is usually cooked at the home of the Bride. Animals are slaughtered early in the morning of the wedding (~ 1:00 a.m.) and again there is the ritual of Ground Wetting and prayers before the slaughter. Between 9:00 and 11:00 a.m. there is the “Joining of the Families”. For the joining, the flags are removed from the roof of the houses and there is the ritual of a flag dance. A procession of the two families accompanied with music would meet at a point close to the Bride’s home where the flag dance would take place. The Bride’s dancer must eventually submit to the Groom’s dancer (i.e. the Groom’s flag must end up on top of the Bride’s flag). A Cake Dance follows the flag dance and similarly the Brides dancer must submit to the Groom’s dancer. Both flags are then flown on the roof of the Bride’s parent’s house with the Groom’s flag at the top. After the church ceremony, a reception is held at the Bride’s parents’ house followed by a Big Drum dance. Two weeks after the wedding a Thanksgiving celebration known as “Return Thanks” is celebrated with another fete. This fete is usually limited to the Bride and Groom’s family very close friends and members of the wedding party. The flags are taken down from the house on this occasion. Whenever a death occurs, we would have a Wake like most cultures. However, we celebrate a number of Prayer Nights or Prayer Meetings for the deceased. These are typically 3rd, 9th and 40th nights celebrations. Either one of the 9th or 40th may be celebrated with a Big Drum dance. The one-year anniversary is usually celebrated with a mass, typically in the morning, at which refreshments such as cocoa tea and sandwiches are served and a Table will be set at the home of the deceased later on in the evening. A Headstone to mark the grave of the deceased is erected between 2 and 3 years after death. This is usually a grand occasion. This is celebrated with a fete that is comparable to a wedding. For this occasion the ritual of the “Ground Wetting” is conducted prior to the slaughtering of animals, a table for the deceased, as mentioned before, as well as some food is left on the grave of the deceased and the party is capped with a Big Drum dance. A traditional food, referred to as “Smoke Food”, due to the smoked flavour, is cooked for weddings, Stone Feasts, Parents Plates and Maroons etc. The menu includes, stewed pork, stewed chicken, stewed pigeon peas, mutton soup, rolled coo coo, rolled rice and an assortment of ground provisions. The Maroon is a village festival and is usually held between the months of June or July whenever, a prominent person in the village has a dream or whenever the island is experiencing a drought. Food is prepared by the villagers and taken to a central location, typically at a crossroad where prayers are being said for rain. Everyone participates in the eating of the food and the event is capped with a Big Drum dance. Whenever there is a Maroon, it generally rains the next day. Notable Maroons in Carriacou are Six Roads, Brunswick, Mt. Pleasant and Harvey Vale Maroons. Beating the pen on the Drum, excellent book about the Big Drum. Previous: Windward and the boat building tradition.